Saw palmetto extract, stinging nettles root extract and pygeum bark extract each support prostate health, and their combination in a single formula creates a synergistic effect. Prostate enlargement can affect several factors of men’s health including urinary flow and overall prostate health. Testosterone, its potent metabolite dihydrotestosterone (DHT), and estrogen are hormones that affect the prostate gland. Testosterone is converted into estrogen via the enzyme aromatase. Aromatase levels increase as men age resulting in a subsequent decline in testosterone levels and increased estrogen production. Testosterone is also converted to its more potent form, DHT, via the enzyme known as 5-alpha-reductase. The combination of increased estrogen levels along with elevated DHT is thought to be a key factor in enlargement of the prostate gland. Natural aromatase inhibitors and botanicals that prevent increased DHT and estrogen levels are included in Prostatrol Forte to help support healthy urinary flow, hormone metabolism, and overall prostate health. 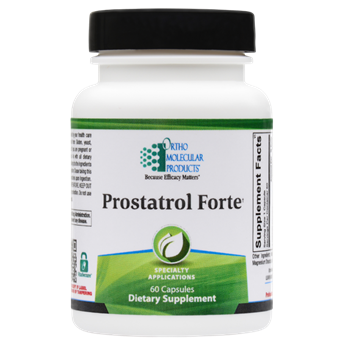 Prostatrol Forte provides herbs and trace minerals that work in synergy to support healthy prostate function. Saw palmetto extract, nettles root extract, and pygeum bark extract each support prostate health in unique ways and work together to support healthy urinary flow, urination frequency, and maintain a balanced cycle of inflammation in the prostate.